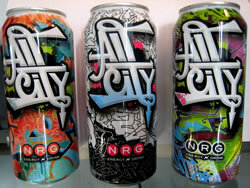 All City is an energy drink from AriZona Beverages. Each can features street art on the label. The drink is a hybrid non-carbonated energy juice (5% juice). The streets are a place that capture such a unique way of life that one can only start to grasp it after spending a considerable amount of time among them. Not only are the streets a way of life, they represent jobs, success and failure, a culture apart from the rest. A culture that ends up showing itself through the outlaw artists known only by aliases. These are the taggers of NY, LA, SF, and so many other big cities where expression is the only vent to keep from going stir crazy in a boxed city. A new beverage from Arizona Tea Company appropriately named All City NRG hopes to capture the lifestyle of these artists in their needs and artwork and does a damn fine job at that. All City has a massive appeal simply from the design of the cans. The drink can be found in three different styled cans, each representing a different form of graffiti tag. Of the three, there’s a green and pink can that clearly shows an example of a “freestyle” tag, a black and white can that is more similar to a stenciled tag, and finally the third can, comprised of orange and teal colors which carries a mixture of both forms of graffiti. The black and white definitely had the most visual appeal to me and tended to be the most favored among others that I asked. Despite my hopes all three cans carried the same flavor; Pomegranate. I have nothing against the pomegranate flavor itself, in fact it’s one of my favorites, but anyone who has ever tried the beverage POM knows how tart the natural fruit tastes. The drink was accompanied with no major surprises. By the smell of the drink I guessed Pomegranates and Apples, with a slight dull flavor mellowing the edge. Sure enough All City is made up of 5% Pomegranate and Apple juice, with a green tea base. The closest drink in comparison to the flavor of this beverage is Starbucks’ Passion Tea. It’s sweet on the first sip, but reveals a bitter twang hidden below the surface. Unfortunately this twang never left and half way through the 16 FL. OZ drink I doubted whether I would buy another. Energy Drink Epiphany #1, chemicals like Caffeine and Taurine are bitter in every drink, but other energy drinks make them easier to bare. How is that I asked myself? Then I realized the key, an 11 letter word that spells success for any energy drink, and sadly what this drink has none of, carbonation. So I decided to do a small test, I took a can of Sprite, mixed a quarter of the can with the remaining half can of NRG and came upon a near perfect energy drink. Lesson be learned Arizona. Arizona's drink did have a few redeeming qualities in the ingredients they chose to include in their Energy Blend. In a single can there is 2000mg of Taurine, 300mg of Caffeine, 200mg of Ginseng, 200mg of Guarana, 200mg of Inositol, 200mg of Glucuronolactone (Supposed to provide a sense of well-being), and 70mg of Milk Thistle (Protects liver tissue). I’m not sure why Arizona is particularly worried about the quality of my liver but I would assume it’s never a good sign when companies are marketing a product that they think should come with protective chemicals. With the wide array of ingredients in energy drinks these days it doesn’t surprise me, but seems unnecessary nonetheless. NRG’s effects were not anything particularly special but were no doubt working the usual magic on my nerves and cognitive abilities. Slight sweating from the 300mg dose of Caffeine and a good amount of energy for plenty of time afterwards. Nice save to an otherwise mediocre energy drink. The mixture of All City and Sprite had me wanting to give it a (4.5/5) it was really that good, but I realized that without the carbonation there was a large enough flaw that I couldn’t even reward it with a 4. The cans look great, the ingredients are spot on, but the sub-par flavor without carbonation was hard to stomach. I really hope that Arizona reads this and revises All City NRG to include carbonation, I’ll even be their first customer. You should be able to find this in your local 711. PREMIUM BREWED GREEN TEA USING FILTERED WATER, SUCROSE, HIGH FRUCTOSE CORN SYRUP, POMEGRANATE AND APPLE JUICES FROM CONCENTRATE, ORANGE BLOSSOM HONEY, TAURINE, MALIC ACID, VEGETABLE JUICE FOR COLOR, NATURAL FLAVORS, CAFFEINE, GUARANA, INOSITOL, PANAX GINSENG, GLUCURONOLACTONE, CITRIC ACID, MONO POTASSIUM PHOSPHATE, VITAMIN C, MILK THISTLE, PANTOTHENIC ACID (VIT. B5), SUCRALOSE (SPLENDA BRAND), VITAMIN B6, VITAMIN B12. How Does All City NRG Compare? All City NRG contains 18.75 mgs of caffeine per fluid ounce (63.40mg/100 ml).